Whether you are trying to lose weight or gain weight; whether you are doing exercise in gym or just trying to stay healthy, the first thing you want to take care of is your diet. How much should be your nutrient intake and when is the right time to eat is very important for you to monitor if you want to stay healthy. It is not possible for any individual to know the nutritional value of each and every food item he consumes. This is where your Windows 8 or 10 apps can help you by telling you how much nutrients your food contains. However, if you simply search for "Diet" apps on Windows 10 or 8 market you will be getting nearly 400 apps for this purpose. So, to help you select the best app among these I have shortlisted them according to the ease of use and number of useful features. Let us look at some of the best Windows 10 or 8 apps that you can use to monitor your food nutrition level. 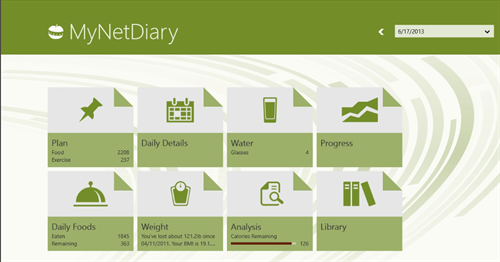 Food Diary and Colorie Counter by MyNetDiary is one of the highest grossing paid app in the Windows Marketplace. It will start with asking for your personal health details (height and weight) which are required by this app to help you keep your weight in control. It will ask you your present weight and the weight you want to achieve and the time frame you want to devote for that. Once you enter these details it will show you your daily calorie requirement. Now what you need to do is enter the diet you plan to follow daily and see if that meets the requirements as mentioned by the app. It would even keep track of your water intake and any health conditions you might be having. If not then you can tweak your daily diet to match your daily diet accordingly. Also, do mention the lifestyle you lead - whether you walk daily or do daily exercises or not. The app's food items list is a little more expansive towards processed food rather than home cooked food. Also, many users have reported it to be buggy. I also faced a few issues initially with the UI but that was more due to not understanding its interface. After a while I was able to use it properly. It would be best that you try for a week before you making the decision whether to buy it or not. This is an official Microsoft app and is quite famous in the nutrition section of Windows marketplace. Of course that can also be attributed to the fact that this app is by default present in the Windows 8 or 10 installation which gives it a chance to be tried out by everyone even if they decide to uninstall it later on. However, if you are really looking for a Diet control app which can help you get the right nutrition content for your weight loss or gain target then this app won't disappoint you at all. It contains a rich set of tools and guides to help you plan your weight loss strategy. There are more than 1000 of workouts, nutritional and medical references and tracking section for your daily nutritional goals. It has a catalog of more than 300,000 food items which will help you give almost exact count of your calorie intake. It has GPS tracker as well as Step tracker which will give you good insights on the physical work you do in a day. Other than that if you are working out then you can go through latest health related articles, Yoga postures or Cardio exercises that you can do. If you get unwell, then that time too this app can help you diagnose your disease by entering your symptoms. Developers of this app recently removed the Strength tracking section which has angered a lot of users of this app. If you too are looking to getting a good body with weight exercises then you might want to avoid this app, but if your focus is normal dieting and basic exercises like walking or running then this would prove to be a highly useful app. Active Life is an app that is not targeted for a single person but has been designed as an app to keep track of the health of all your family members. However, if we consider the fact that nowadays most of us have our own person gadgets, this app can be a dampener if you other family members feel that they want to have a personal control over what they eat by monitoring their health information themselves. But in case your other family members are not much concerned about their health and you are a mother or probably the responsible person in your family who wants to know and keep track if your family is getting the proper diet or not then this app can be a lot of help. You have to create profiles for each person in your family and have to enter their personal details like age, weight, height, etc. If any of your family members has some special health needs like taking medicine on time or monitoring the blood glucose or weight, then you can set trackers or reminders in this app. For women though who are more concerned about getting the right figure there is no question about your waist or hip size which means that it is not giving an special attention to get you your hourglass figure. Also, once you have entered the medication in the app there is no way to change it. For example some medications change in the volume of dosage but here, you don't have the option to change it. Similarly, there is no area to input your past medical history or medical lab results which obviously will have a great effect on your diet and exercise plan. Health Vault is a simple but efficient app to keep your dietary targets in line. After installing and entering your personal health details you have to enter your targets. Once you have done this you can prepare a diet plan for yourself that helps you meet your daily calorie and nutrients requirements. After that it will manage your workout, steps and diet details to help you move towards you weight aim. It will work best if you also enter your present blood glucose, blood pressure and cholesterol level. You can easily monitor the trends in your health changes and feel happy about the progress you make or make corrections if you are falling behind. The only complaint for this app is that it does not have nutrient values for many of the non-US food items which means you will have to manually enter the nutrient value after searching it somewhere else. The apps listed above are the best among the Health and Fitness section of Windows marketplace and are available for both Windows 8 and Windows 10. Also, each one of them is free except for the very first one. So if you are really serious about bringing your health in control by controlling what you eat, when you eat and how much you exercise, then download any one of these apps and start leading a healthier life.